The custom shapes already available in Photoshop cover a wide range, but they might not fill all your needs. You can purchase commercial collections of custom shapes from a couple of sources. You can create custom paths and define shapes from them, too. But you’ve already got bunches of custom shapes on your computer, just waiting for you to use them. Select Photoshop’s Type tool and take a look in your Font menu. Check out the fonts already there with names like Wingdings, Webdings, Symbol, and Dingbats. These are all examples of symbol fonts, which are fonts that have shapes and symbols rather than letters and numbers. Many more typical fonts also have special characters available when you use the Shift key, the Option/Alt key, and the Shift key in combination with the Option/Alt key. Choose File→New to open a new document. The document can be virtually any size and can be either grayscale or color. Select the Type tool and pick a font. With the Type tool active, choose a symbol font from either the Options bar or the Character panel. The font size doesn’t matter much because you’re creating a vector-based shape that you can easily scale. The foreground color doesn’t matter either because shape tools rely on the foreground color active at the time you create the shape. Type a single symbol and then end the editing session. Convert the type character to a shape layer. With the type layer active in the Layers panel, use the menu command Type→Convert to Shape. 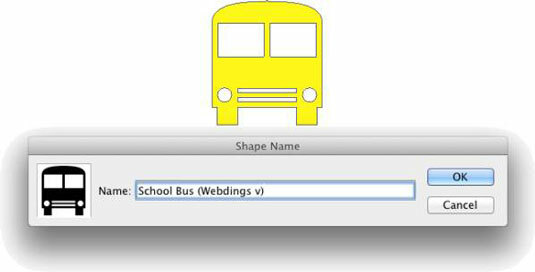 Choose Edit→Define Custom Shape, give your new shape a name in the Shape Name dialog box, and save it. Your new shape is added to the Custom Shape picker, ready to use. Remember that your custom shapes aren’t truly saved until you use the Custom Shape picker menu command Save Shapes (to save all the shapes in the picker as a single set) or the Edit→Presets→Preset Manager command (to save a set of selected shapes). In the Preset Manager dialog box, Cmd+click/Ctrl+click each of your custom shapes and then click the Save Set button to save them as a set. Until you take this step, the shapes exist only in Photoshop’s Preferences file. If the Preferences become corrupt, you could lose all your custom shapes. This holds true, too, for custom brushes, layer styles, swatches, and the like — use the Preset Manager to save all your custom items. When saving custom shapes (or layer styles or brushes or any of your other custom bits and pieces) with the Preset Manager, save them in a folder outside the Photoshop folder. That prevents accidental loss should you ever need to (gasp!) reinstall Photoshop. 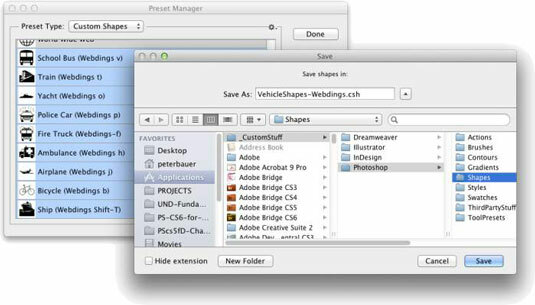 The figure shows one possible folder structure for saving and organizing your custom bits and pieces. When you installed Photoshop, you were offered the option of migrating presets from earlier versions of the program. If you did not do so then, you can add those older presets to Photoshop’s new Presets folders by choosing Edit→Presets→Migrate Presets.